We have worked with schools & sports clubs for over ten years in providing new sports floor solutions and renovating their old timber sports floors. In both cases with have also provided the sports court line marking to provide our customers with a ‘ready to play’ sportshall, once we have finished. 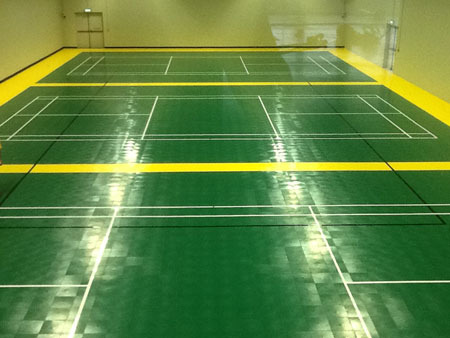 Over the last eighteen months have installed snapsports modular sports floors in Cork, Galway and Westmeath for a school, community centre and GAA club, respectively. Snapsports is globally recognised as a leading modular sports floor provider for both indoor & outdoor, for over thirty five years. Installation. All Irish sports floors took no longer than four days to install. See installation video below. Cost. 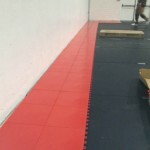 Snapsports modular floors are significantly less costly than traditional wooden sports floors. Guarantee. A 12 year full guarantee ensures every customer can make a confident buying decision. Approval. SnapSports surfaces have been accredited by the following sports organisations; FIBA (basketball), USFF (Unites States Futsal Federation), USA Team Handball, Special Olympics and the ITF (International Tennis Federation). 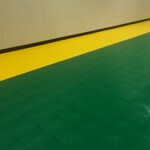 Snapsports flooring systems were used by the U.S. Olympic teams in London 2012. Renovating Older Timber Sports Floors. 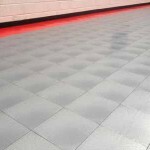 Fitness Functions has overseen many school timber sports floor renovation projects over the years. 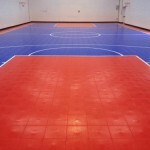 We bring dull and worn sports floors back to life. Apply final top coat of lacquer to seal the lines. Normally we would apply sports line marking for 4-8 courts; 4 x badminton courts, 1 x 5-a-side court, 1 x basketball court, 1 x volleyball. Sports Surfaces in Ireland..Westmeath & Galway. Loughegar, Co. Westmeath and Carraroe, Co. Galway to be exact. These GAA Clubs and community centres are latest sports venues in Ireland to place their trust in the SnapSports brand. While their priority was naturally orientated towards sporting surfaces they were also very keen on having the multi activity properties to enable the hosting of concerts, local events and meetings for their members / visitors. 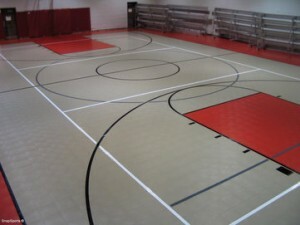 Sport Surface Installation & Guarantees. Both sites took no longer than 4 days to lay the sports flooring and this also accounted for line marking 4 sports courts (Loughegar) and 4 sports courts (Carraroe). These installation times are significantly quicker when compared to traditional timber floors. While the installation times are impressive, the 12 year guarantee is also worth remembering. 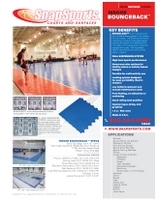 Sports Floor Product & Features. Both community centres decided on the “Indoor Bounceback” model, primarily for its multi sport and multi activity properties. The projects were finished with specifically designed sports skirting board which ensures that balls rebound off the boarding at predictable angles which is not always the case with other products. All doorways were made wheel chair friendly. Sports Surfaces Sites Key Facts – Summarised. If you require additional information or if you would like Fitness Functions to visit your sports hall and demonstrate the SnapSports product please do not hesitate to contact us. Email our digital marketing manager; niall@fitnessfunctions.ie We look forward to your email. 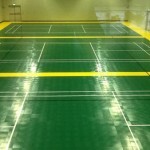 Snapsports Flooring Installations in Galway & Westmeath. 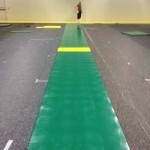 Further to our Snapsports Floor installation in Co. Cork late in 2012 (see site photos below), we’re delighted to announce an additional two flooring projects will take place in Ireland, at sportshall locations in Galway and Westmeath. Each site is expected to take no longer than 3-4 days to install the sports floor which is guaranteed for 12 years. Both Community Centres choose the indoor “Bounceback” product which provides excellent shock absorption and ball response for multiple activities. This particular model also boasts low maintenance costs and seamless design for consistent play as its main benefits. Site 1 (Westmeath) Colours;Green & Gold. Site 2 (Galway) Colours; Red & Black. Once the floors are installed, linemarked and ready for use we’ll update this Blog with these up-to-date images. We are once again expect these Snapsports flooring projects to be completed on time, allowing the sports centres many years of multi court active use. 1. Flooring Cost. 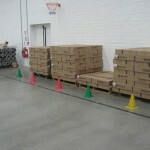 Snapsports modular floors are significantly less costly than traditional wooden sports floors. 3. Installation. With minimum preparation work and a fast and clean installation, the majority of projects require only a matter of days which significantly reduces the cost of labour. Modular Sport Surfaces come to Cork National School. Snapsports installed in Kilbrittain National School, Cork. Click to View Latest Kilbrittain Photos. We are delighted to report that will be installing the Snapsports ‘Indoor Bounceback‘ sports floor in Kilbrittain National School’s, sportshall. 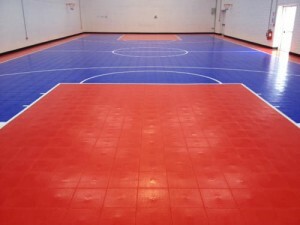 The indoor basketball court will be bright blue, the run offs bright red and the finally the basketball keys will be coloured bright red. 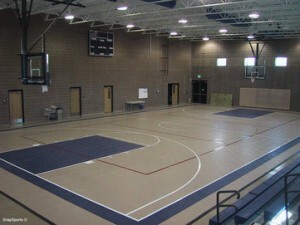 The sports floor installation will require approximately 4/5 days on site. We’ll post images and videos of the sports floor installation once the project is complete. SnapSports founded in Salt Lake City, Utah, has been inventing, engineering, manufacturing and providing the world’s leading outdoor multi-courts, basketball courts and modular sport surfaces for nearly four decades. 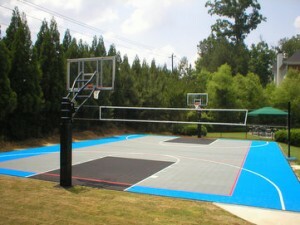 This means their experience is second to none in the field of modular sports surfaces. SnapSports surfaces are suitable for – Basketball, Volleyball, Futsal, Tennis and net games, Hockey and Handball, in fact the multi-purpose sports surfaces range ensure that you will get the maximum performance from your floor regardless of your main sport. Guarantee. With a 12 year full guarantee every customer can make the decision to purchase SnapSports products with complete confidence. Accreditation. SnapSports surfaces have been accredited by and are approved for use by the following sports organisations; FIBA (basketball), USFF (Unites States Futsal Federation), USA Team Handball, Special Olympics and the ITF (International Tennis Federation). 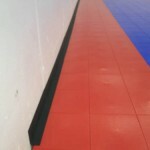 Snapsports flooring systems were used by the U.S. Olympic teams in London 2012. Installation. With minimum preparation work and a fast and clean installation, most projects require only a matter of days the cost of the surface is kept to an absolute minimum. See video below. Introducing Modular Sports Surfaces by SnapSports. 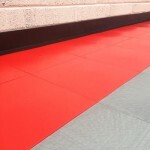 Modular Sport Surfaces and Flooring. 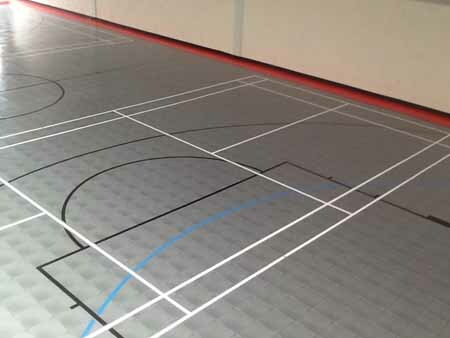 Click to view our first Irish School Basketball Court installation. Fitness Functions are delighted to have teamed up with SnapSports Inc to bring their highly accredited range of indoor and outdoor sports surfaces to the Irish market. 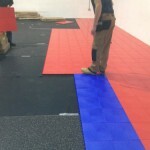 SnapSports Inc were founded in Salt Lake City, Utah over 3 decades ago which means their experience is now second to none in the field of modular sports surfacing. The SnapSports modular sports surface can be installed indoor and outdoors and is applicable to both commercial and residential markets. With a 12 year full guarantee every customer can make the decision to purchase SnapSports products with complete confidence. 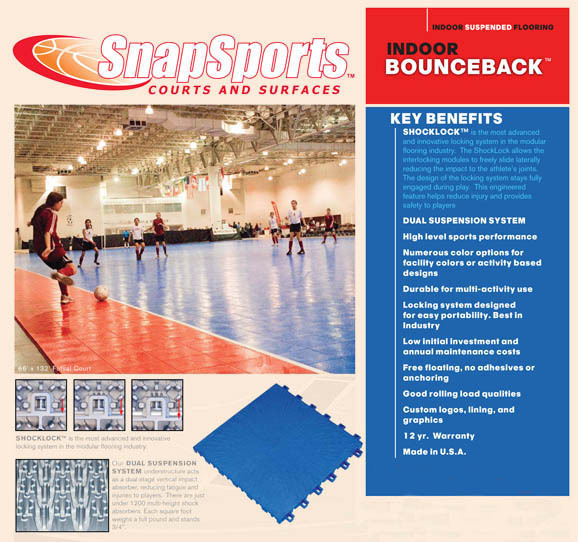 SnapSports surfaces are suitable for – Basketball, Volleyball, Futsal, Tennis and net games, Hockey and Handball. The multi-purpose sports surfaces range ensure that you will get the maximum performance from your floor regardless of your sport. SnapSports surfaces have been accredited by and are approved for use by the following sports organisations; FIBA (basketball), USFF (Unites States Futsal Federation), USA Team Handball, Special Olympics and the ITF (International Tennis Federation). 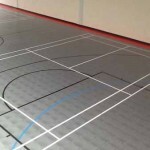 SnapSports is the ideal multi-purpose sports floor for your hall. With minimum preparation work and a fast and clean installation the cost of the surface is kept to a minimum– couple that with a range of surface options, a wide range of vibrant colours and a full 12 year guarantee you know you’re on to a winner. If you require additional information or if you would like Fitness Functions to visit your sports hall and demonstrate the SnapSports product please do not hesitate to contact us. Click images below for more information on our main website. Fitness Functions have recent been involved in the renovation of a timber sports floor in Colaiste Bhride, Enniscorthy. The old timber floor was dull, marked and in need of a refurb, after a thorough sanding and application of 2 coats of sports specific lacquer we applied a complete set of new games lines and then a final top coat of lacquer was applied to finish. The line marking was applied to: 4 Badminton courts, a Five a Side court, a Basketball court and a Volleyball court. 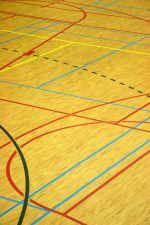 The floor has been given a completely new lease of life and is good to go for many more years — at a fraction of the price of a new sport floor. 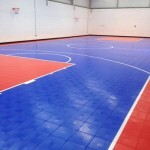 Please feel free to contact us for more information and costs of renovating your existing sports floor.